1/3 of My Groceries Go in the Trash. Here Are the 6 Things I'm Doing to Stop That. Anyway. You see a lot about going green in convenient delivery packets: one month to this! eight weeks to that! a single page away from carbon neutral! And those guides, and books, and plans are not just important – they really are vital. “What’s the single most important thing I can do for the planet?”, a common question, is an earnest one. Repeated actions form habits, and habits create lifestyle. By all means, test those tips, climb those steps: chip away we must. I’m doing them right along with you. 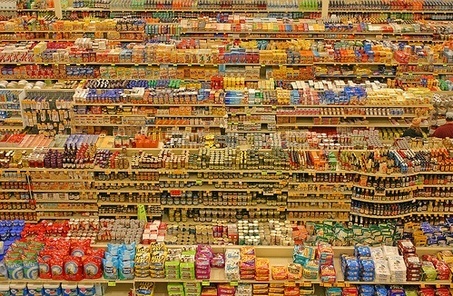 Our food has been so plentiful and so cheap for so long, we’ve forgotten how to shop! My pronoun choice in the headline is not about shame and it’s not about guilt – for me, it’s about proactive ownership of a problem (call me a control freak). If you want to live greener, if you want to help others, if you want to have an impact upon the current interrelated problems we collectively face, here’s the thing: simply start with your next grocery basket. 1. I’m making a list. Even if it’s just toilet paper and tonic water, make a list and stick to it. Impulse purchases are rarely necessary. 2. And…I’m checking it twice. The goal is conscious consumption, so be sure the items on the list are necessities. This concept might seem distasteful at first; we’re so accustomed to buying snacks and extras on the slightest whim. Our grandparents grew Victory gardens (I think within two years we will be doing this again); my Baby Boomer mother scrapes the peanut butter from the jar because that’s what her mother, who lived through the Depression, taught her to do. In decades since we’ve learned to label these actions as “frugal”, and we need to unlearn this yesterday, because they’re actually generous. To paraphrase Suze Orman, true generosity – with yourself and others – means doing the right thing at the right time in the right measure. So be generous, and double-check. 3. It’s not just what; it’s how much. One of our most popular articles shares tofu-free tips for vegetarian dining. Most of us know that cutting our meat consumption, even one day a week, can significantly help the planet. But it’s not just what we eat – it’s how much. We buy too much; we’re served too much; we munch too much. School yourself. Relearn shopping: when you get to the check out line, stop and put 1/4 of your items back. If you’re shopping the way most folks do, you won’t eat them. When you’re dining out, ask for a half portion or split the entree with your date. (Feed him a bite or two and he’ll forget to complain.) Rework the old diet trick of leaving two unfinished bites on your plate and take a smaller portion to begin with. I can never manage this, so I use smaller plates. We don’t just consume over a pound every day; we Westerners also waste a pound a day. That’s two pounds more impact than any Red tank top could ever hope for. Relearning grocery shopping starts with knowing the right numbers. This one is easy – and can be fun. Even if you don’t grow anything, I guarantee your green thumb neighbor or relative will be happy to take your scraps. 6. Eat the ugly apple. Going local, buying CSA, choosing organic – there’s a whole host of greener, tastier, cheaper, better options. Start by checking out the farmers’ market this weekend and go ahead – eat that ugly apple. This isn’t just “for the planet” – it’s to make you more aware of what you buy. I used to waste whole bags of wilted veggies on a weekly basis until I switched over to shopping at the farmers’ market. It takes a little more time and effort to go to the market and I end up thinking a lot more about my purchases. Even though they tend to be cheaper than the store, I don’t want to waste them because that means wasted time, which I can’t stand. There are so many ways to ace your grocery shopping – from joining a CSA to choosing better meat to cutting down on your grocery bill. Start learning!